RUDN Journal of Language Studies, Semiotics and Semantics elaborates and deepens the topics of general and special theories of language; theory of speech activity and speech; semiotic features of sign systems and those of language units, belonging to different levels and texts; semiotics and poetics of literary texts; functional semantics of lexical and grammatical units; pays attention to complex and comparative typological research of language categories and units. General goals and objectives of the journal, besides the development and propaganda of humanities, include the integral characteristics of paradigms of philological and humanitarian knowledge – symbolic and social paradigms, in particular. As to the application, methodology and complex, integral methods of theoretical research of language and society are being elaborated as well as the research in systemic linguistics; and language modeling is also included. The journal addresses philologists, philosophers and other humanitarians. Its authors are PhDs, Doctors of Humanities, post-graduate students, PhD candidates and MA students from Russia, as well as from abroad. The journal publishes 4 issues per year. The information about all the articles published is archived in Russian Electronic Scientific Library (eLIBRARY.ru). The direct URL to the journal issues: http://elibrary.ru/contents.asp?titleid=31914. You can search through article metadata (title, author, keywords, abstract etc.) on eLIBRARY.ru. The URL to article’s full text is available on the article’s page on eLIBRARY.ru. 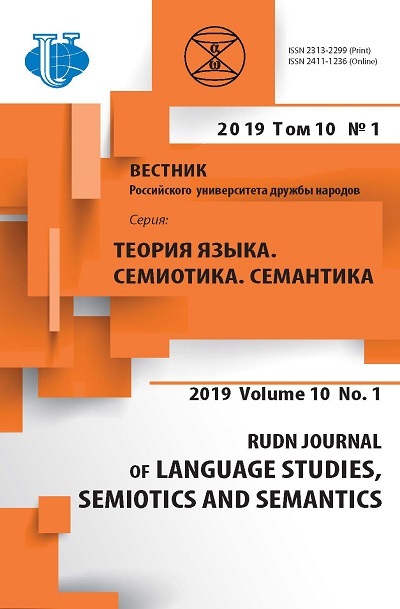 The articles’ full texts are stored on the journal’s server and can be accessed through this page (http://journals.rudn.ru/semiotics-semantics/issue/archive) or from each article's individual page on eLIBRARY.ru.